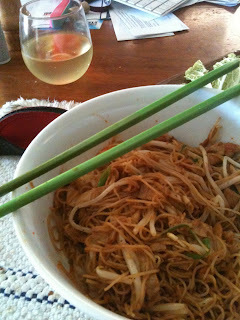 The Guerrilla Gourmet: Hunger Challenge Dinner Day 2: Spicy stir fried noodles! Hunger Challenge Dinner Day 2: Spicy stir fried noodles! Fuchsia Dunlop's excellent Revolutionary Chinese Cookbook: Recipes from Hunan Province and Land of Plenty: Recipes from Sichuan Province are two of the most lovingly stain-splattered in our kitchen. The xtremely detailed, authentic treatment of Hunan and Sichuan cuisine has opened our eyes to the robust, spicy, and savory falvors of those province, and introduced us to a whole new array of exotic ingredients and sophisticated new techniques, gleaned from her work in dozens of major restaurants all over the two provinces. But it was her work cataloging the humble but delicious cooking of the rural farmers and small noodle shops that had us reaching to her books for inspiration this week. "Stir-fried rice noodles with chicken slivers" is one of our favorite light dinners and we thought it would be pretty cheap, but we still had to make a few modifications to squeeze it into the budget this week. Check the recipe and price breakdown after the jump! Usually we would make this with a chicken breast and with wide, fresh rice noodles. To compensate for the budget crunch, we followed Dunlop's vegetarian version, which calls for extra mushrooms, traded down to the cheapest dried rice noodles we could find, and tossed in a leftover scrap of tofu. It ended up being delicious and cheap, but I'm glad we had some other, more filling diners scheduled later in the week! Total Cost: $1.73 for two servings! 2) Heat half the oil in a wok, then toss the noodles around until hot, soft and fragtant. Remove the noodles to a bowl and cover with a plate. 3) Heat the remaining oil to smoking then add the garlic, ginger, chiles, tofu, and mushrooms and stir fry about thirty seconds until fragrant. 4) Add the Shaoxing wine, then tip the noodles back in and splash with soy sauce while you toss things around. Oh boy, we have the Hunger Challenge and Fuschia in common. Have you read her memoir? It's a delicious read, with recipes.